Rockwell, a famous 20th-century American artist, was inspired by President Franklin D. Roosevelt’s speech to Congress in 1941 on American involvement in World War II. Roosevelt spoke of the “Four Freedoms,” or the humanitarian values that were at stake in the war: Freedom of Worship, Freedom of Speech, Freedom from Want and Freedom from Fear. Rockwell painted four images to go with those ideas, which were printed in four successive issues of the Saturday Evening Post in 1943. 2018 is the 75th anniversary of Rockwell’s works, and Smithsonian deemed it the right time to revisit those themes. Smithsonian commissioned four contemporary artists — Tim O'Brien, Melinda Beck, Ryan Schude and Edel Rodriguez — to recreate one of Rockwell’s images. While Rockwell based his paintings on his white Vermont neighbors, the four artists chose to update the images to represent a new, more diverse America. In the original “Freedom of Worship” painting, for example, the five central subjects are all white. O’Brien decided to paint people of different backgrounds and religions in his cover for the March Smithsonian issue. Smithsonian collaborated with NYC-based design firm Priest + Grace, which has done work for Hearst, Conde Nast and Reuters,- to redesign the monthly print magazine. The publisher wanted a more modern look and feel. "We wanted to change the overall look of the magazine to reflect the great content we’ve been putting inside lately. 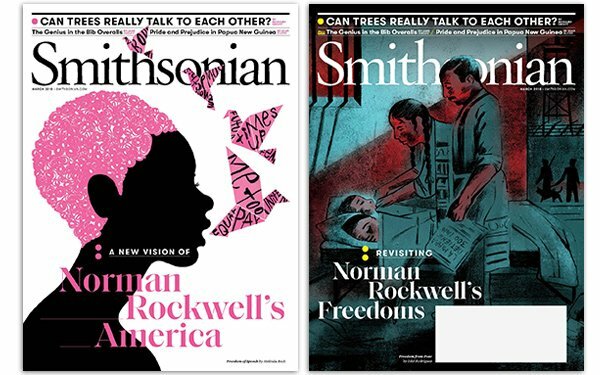 We’re publishing some amazing and startling work by award-winning writers, photographers and illustrators, and we wanted to give them a cool new showcase,” Smithsonian editor-in-chief Michael Caruso told Publishers Daily.